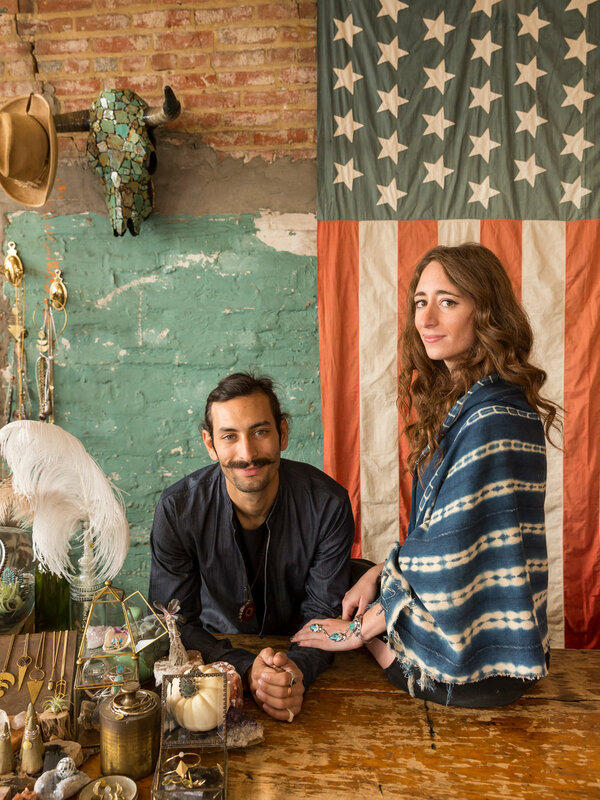 For four to eight weeks out of the year, Erin Gavle, her boyfriend, Chris Miele, and their dog, Mr. B, set off from their home in Corktown to explore the West and find unique artifacts for their Detroit-based general store, Eldorado. The couple likes to follow old trade routes in their white, hand-built “vansion,” a 2005 Dodge Sprinter named Rusty Rita. During these explorations, they try to tap into the cultural and topographical uniqueness of the region, exploring the unlikeliest of places and getting lost on purpose. “When you see the cloud of dust behind you, you’re doing well,” Gavle says, eyes twinkling as she reminisces. Sitting with Gavle and Miele in their van, the smell of burning sage and the wind blowing leaves past the open door, you almost forget you’re not on the road instead of sitting right outside their store. Home for Gavle is her apartment right above Eldorado. At the corner of Cochrane Street and Michigan Avenue, it’s hard to miss. Originally the old Tiger Stadium souvenir shop, it is now a beautifully decorated, two-story brick building beckoning all who drive past to come in. Although filled with homemade trinkets and treasures, it is more than a mere general store. To Gavle it’s a platform she uses to share the things she finds beautiful, important, and sacred on her travels. 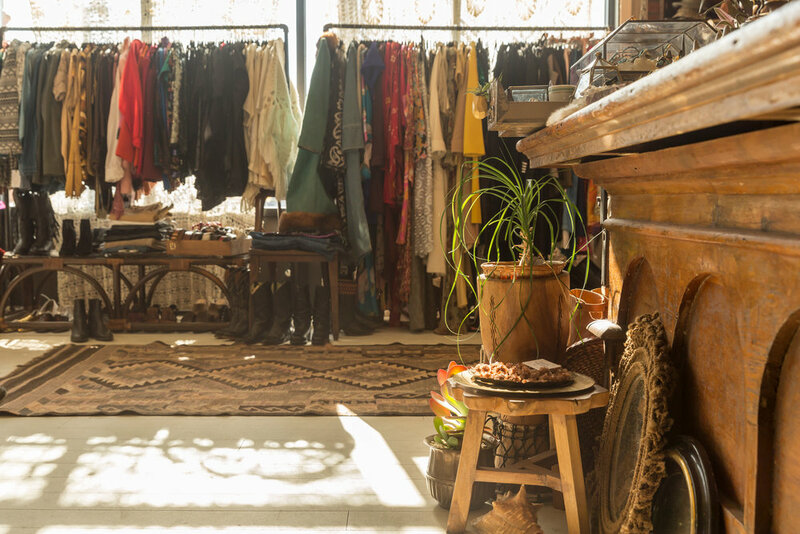 From the moment you walk through the mosaic-lined doorway you’re inside her world — one made up of sage, crystals, jewelry and carefully curated vintage clothing. While filled with many foreign things, the store nonetheless exudes a warmth and comfort you might find when walking into your friend’s home. Gavle herself describes Eldorado as many things — a well-curated general store, her own Burning Man art installation and her living room downstairs. It is a place where she gets to showcase her friends’ work, neighbors’ candles, and the jewelry of all the artists she visits on her travels. While it’s hard to imagine Gavle anywhere other than behind the register ready to greet anyone who walks in, four years ago she was working as a creative director at an advertising agency in New York City. That moment she cites as the beginning of the end. “I called it the Hard Restart. I just needed to start over,” Gavle explains. Soon after, she quit her job, moved to L.A., and began to re-prioritize what was important to her. Gavle started by asking herself what she loved to do. “I felt like that would be a good place to start, if you were going to rebuild a life, to do things that you want to do all the time,” she remembers. Gavle originally planned to return to advertising. But some soul-searching led to the conclusion that she could better figure out her passion and purpose if she left it behind. Traveling and shopping were what she decided on. However, even then, opening a store hadn’t seriously crossed Gavle’s mind until she found a scrap of paper under her childhood bed. On it was a list of things she wanted to achieve in her life as an eighteen year old. Over the years, she had forgotten how important that goal was to her. “It was a nice gift from the universe that I found that letter to myself so many years later,” Gavle says. It was the sign she needed to start pursuing what she loved. By July 2013 she had opened Eldorado. Even before she had truly opened people began to trickle in. Gavle describes the people who first came into her store as “extreme tourists,” people from outside the United States — mainly Europe and Australia, or “extreme locals,” people that lived within the city limits. However, she nonetheless tried to cater to everyone. “When I first opened there weren’t a lot of shopping experiences in Detroit,” she explains. She wanted Eldorado to be a place where both a seven year old and a 70 year old could come in and find something that they enjoy. These days the store is filled with people from all across Detroit and the suburbs, and Gavle still tries to stock her General Store with things that will delight almost anyone. While the store may be the physical manifestation of her pursuit of happiness, the act of traveling out West is just as crucial to Gavle’s new way of life. “It’s inspiring to me, it makes me think differently, and allows me to create and hopefully share those things with others,” she explains. With their van, they have the freedom to go where they like on a whim and interact and buy from store owners and artists in person. Some places always remain on the list — Joshua Tree, California; Laramie, Wyoming; Durango, Colorado; and Portland, Oregon. Other places Gavle chooses are based on the stores she wants to visit and the artists she wants to meet in person. These in-person visits have given the couple a leg up as they have allowed the two to have authentic interactions with people as opposed to connecting with them over the phone, by email, or Instagram. To this day, she has never been turned down by a single person. Unlike its namesake, Eldorado does not symbolize the quest for unimaginable wealth, but the freedom for Gavle to follow her own dreams — the lifestyle she chooses to live. She hopes that the store can be an example for others on their own quest. Even though they are both drawn to the culture of the American West, Gavle and Miele always end up back where their journey began: Eldorado General Store. She believes that Detroit is the environment, community, and the city where she wants to continue to work on herself and her business. Detroit is one of, if not the only place she believes she can find such a strong community that will continue to support her at every turn. The next step in her journey? Figuring out how to bring her love for Detroit to the places she visits out West. In the meantime, Eldorado will remain a literal and figurative golden beacon, a place where Gavle can share her love for travel and Detroit with every person who walks through her doors.